Rydym wedi gwneud den helyg. 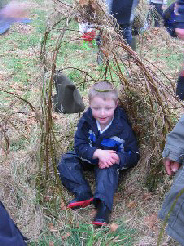 We have made willow dens.The willow will grow during the spring and summer to provide a fun playing and learning area. Bingo is a great game. The aim of the game is to fill your board with counters. The numbers on each board go from 1 to 90. The game is very annoying because you never know which number is coming next. Everyone came to the show and Joe and Mair started the show. I was acting like Huw Trefaes Fawr and a Wise Man. The show was really great. 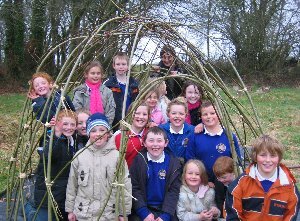 I enjoyed the game at the allt (the woods) and enjoyed making a house in the allt. I like Weetabix because they are great. We come in the morning for breakfast club. We have toast after cereal. Mrs Savinelli does the toast. Mrs Sandra Davies does the cereal. Mrs Davies does it sometimes and she sometimes makes a mess!! We have juice with our breakfast. We got sticks from the woods and threaded string through them and then put leaves through them. We made dens for little animals. I played football for Ysgol Beulah at the Urdd Centre. My team-mates were Dafydd, Rhys, William and Todd. We did not score any goals, but we had fun and everyone enjoyed themselves. There were lots of teams from different schools and it was fun watching all the teams play. I hope I can play for the school again. We have made an apple crumble. We have to wash our hands and wear an apron. Things needed, bowl, scales for weighing, flour, margarine, sugar, fruit, knife, spoon and ovenproof dish. We rubbed the margarine into the flour and added the sugar. We peeled the apples and put them in a dish and added the sugar and covered the fruit with the crumble and placed it in the oven. Remove from oven and eat. Lovely! We have two teams to play rounders. Mrs Jamieson is the bowler. I can hit the ball very far away. I like scoring a rounder. When I score a rounder I feel good.